Antje Rávic Strubel is an author and freelance journalist living in Potsdam. Her novels include: Sturz der Tage in die Nacht (S. Fischer 2011) which was nominated for the German Book Prize; Kältere Schichten der Luft (S. Fischer, 2007), which was shortlisted for the Leipzig Book Fair Award; Vom Dorf. Abenteuergeschichten zum Fest (DTV, 2007); Tupolew 134 (C.H. Beck, 2004), Fremd Gehen: Ein Nachtstück (Mare, 2002), Unter Schnee (DTV, 2001), which has been translated into many languages, including English: Snowed Under (Red Hen Press, 2006) and Offene Blende (DTV, 2001). She is the author of numerous radio plays and is the German translator of Joan Didion’s Blaue Stunden (Claasen, 2012) and Das Jahr magischen Denkens (Claasen, 2006) as well as a collection of Didion’s essays, entitled Wir erzählen uns Geschichten, um zu leben (Claasen, 2008). She is author of the travel essay books Gebrauchsanweisungen für Brandenburg und Potsdam (Piper, 2012) and Gebrauchsaweisungen für Schweden (Piper, 2008). 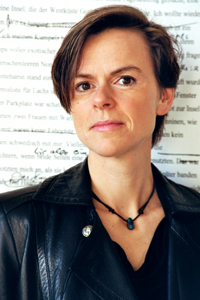 She was a guest professor at the German Literature Institute in Leipzig, in 2003/04 and 2010/11, and regularly reviews American and Scandinavian literature for Deutschlandfunk. Strubel has received numerous prestigious literary awards, including the Hermann Hesse Prize (2007), Bremer Literature Award (2005), Marburger Literature Award (2005), the Roswitha-von-Gandersheim-Award (2003), The Academy of Arts Award for Literature (2002), and the Ernst-Willner-Award at the Ingeborg-Bachman competition in Klagenfurt (2001). She was writer-in-residence at the Villa Aurora in (2004) and is currently writer-in-residence at the Helsinki Collegium for Advanced Studies (2012).